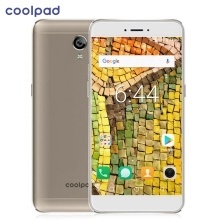 The Coolpad E2C features a big 5.0inch HD display with 1208*720P resolution for presenting clear video and the vivid pictures taken by the professional photographer- 8.0MP + 5.0MP cameras. The phone is powered by Snapdragon MSM8909 Quad Core processor and running Android 7.1.1 OS, coupled with 1GB RAM 16GB ROM of storage, for delivering premium performance. The Coolpad E2C features a big 5.0inch HD display with 1280*720P resolution- enough clear and comfortable for enjoying your favorite video and the vivid pictures. Equipped with 8.0MP camera on the rear and 5.0MP front selfie camera, the E2C is a ideal photographer accompanying with you, capturing all of beauty around you and recording the important moments. The built-in 2500mAh battery with low consumption and smart charging technology can offer long endurance. The E2C adopts smarter and sweeter Androids OS- Android 7.1.1, boosting the whole use experience to a new level. Powered by Qualcomm Snapdragon MSM8909 Quad Core processor, coupled with 1GB RAM 16GB ROM of storage, for delivering premium performance at lightning speed, the phone can run many apps smoothly at the same time.